Master a broomstick with skilful assistance and expertise from our wizarding professors. Each class is trained in the basics of levitation, on the very lawn where Harry had his first flying lesson! Discover the locations where the scenes were shot and hear behind-the- scenes anecdotes with an entertaining costumed guide on our 'Alnwick on Location' tour. Meet characters inspired by the magical world of Harry Potter and experience a theatrical performance like no other! Costumed Witches and Wizards are especially welcome to witness Potter Inspired Characters magnificent perfect blend of comedy, mischief and tomfoolery! And don’t forget to summon some brilliance and embark on a wizarding adventure through the grounds of Alnwick Castle with our Wizard Trail. Collect a sheet from Artisans Courtyard and see how much you know! The above activities and specialist performances will be available during the 20th – 24th of July and the 24th – 31st August. Discover an enchanted sorting hat that loves to be worn. Place it upon your brow and listen carefully to its great words of wisdom. Why not try it for yourself and come see where your allegiances truly lie? Watch our masterful wandmaker Jon Purkins weave, thread and breathe a little magic into what would appear to be ordinary willow. Then give it a go yourself by decorating and personalising your very own wand! 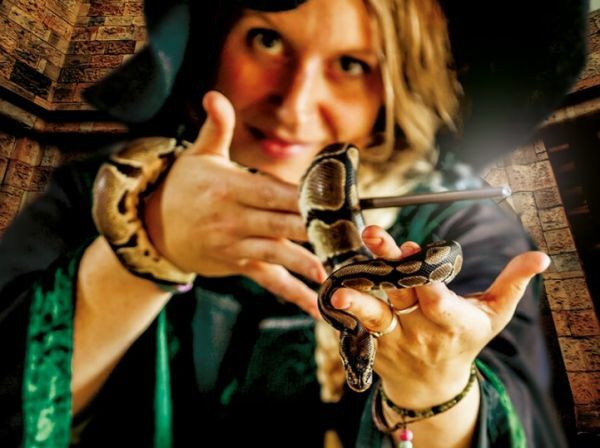 These spellbinding Wizarding Week activities are free with admission to Alnwick Castle, so don’t delay in setting the dates in your diary! Please check the ‘What’s On’ board upon arrival for timings and locations, as these can vary throughout the season.